Stock photo of Bronze statue of a jester atop a fountain back dropped by the colorful facades of buildings in the Old Town district in the City of Landshut, Bavaria, Germany, Europe. Bronze statue of jester back dropped by colorful facades of buildings in the Old Town district. 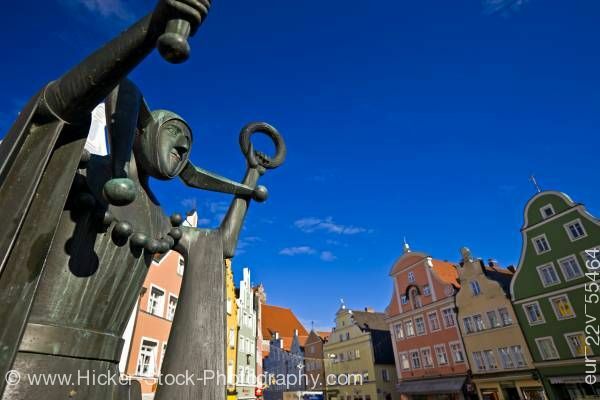 This stock photo shows a unique bronze statue of a jester atop a fountain back dropped by the colorful facades of buildings in the Old Town district in the City of Landshut, Bavaria, Germany, Europe. A bronze statue of a jester holds his hands up with a ring in the left hand. He wears a tunic complete with jingle bells along with his floppy eared hat. The statue stands in front of the attractive facades of the buildings that decorate the Old Town district in the city of Landshut. Wonderful colors of yellow, green and pink along with windows trimmed in white add to the design of the facades. Each façade is unique with its own design of curves and straight lines. Bronze statue of a jester atop a fountain back dropped by the colorful facades of buildings in the Old Town district in the City of Landshut, Bavaria, Germany, Europe.